If you owned a Samsung Galaxy Note 7 device and whether you loved or hated it, it’s time to look for alternatives as Samsung has finally stopped manufacturing this device. However, with so many other exciting phones in the market, it won’t take long before you find your new favourite smartphone. Stay Safe – Take action NOW: Make sure you erase all data on your Samsung Galaxy Note 7 and shut it down for your safety. Numerous owners have reported a faulty battery causing explosion while using the device. You can return the phone for a full refund. 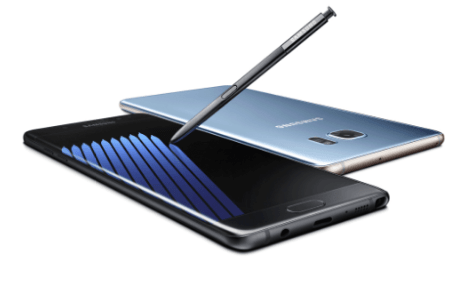 What are some good alternatives to Samsung Galaxy Note 7? Once you are done disposing off or returning the phone to the company, it’s time to look for a new phone. Luckily, you are going to find many strong candidates to replace Note 7. However, to make a wise choice, you must compare the basic features of the new phone with the features you found in Note 7. It is the best possible exchange for your Samsung Note 7 because both phones are nearly identical in design. Not just the design, you will find the similar features that were the reason to purchase Note 7 in the first place. The touch screen of S7 Edge is just 0.2 inches smaller; being 5.5” instead of 5.7”. Although the slighter difference in size, it’s easier to use and barely noticeable. Unlike the Type-C plug port of Note 7, S7 uses the old micro USB charging port. It means you can use your old chargers, accessories or cables for the S7. The best thing about the S7 is that it comes with a 3,600 mAh battery. On the other hand, Note 7 only has a 3,500 mAh battery. So, you can have nearly identical experience with a better battery life. Luckily, it’s almost 250$ cheaper than the Note 7 so when you decide to return the exploding phone of Samsung, get the S7 Edge in return. This latest phone by Google matches the Note 7 for power with the latest Snapdragon 821 processor and a 4 Gigabytes of RAM. Although, some customers might not like it for the lack of MicroSD slot but it has 5.5” QHD AMOLED display that shows vibrant colours and matches in quality with Samsung’s industry leading display technology. Other than the random flagships in the market, Pixel series has fast charging, metal body, and a biometric unlock system that feels premium. Photography has performed so well on the new Pixel series and considered to be better than the already impressive Note 7. If you are addicted to the S Pen feature and don’t want to spend time looking for a third-party Bluetooth stylus, then you should go for the last year’s model Samsung Note 5. Unfortunately, this isn’t available in the UK, but you may be able to find it online. It’s relatively old and has a smaller screen but you will be getting the stylus capabilities that no other phone offers. It has a smaller battery, no MicroSD card, and waterproofing. The only drawback to getting Note 5 is that you can’t extend the storage other than the built-in 32 GB of ROM. The only phone that matches Samsung Note 7’s in size is Nexus P6 as it comes with 5.7” QHD display. It has just 3.7 GB RAM though. Nexus P6 by Huawei comes with Qualcomm Snapdragon 810 processor which is an older technology. But, the phone has Android Marshmallow 6.0 installed and an incredibly good battery of 3,400 mAh. Not to mention the good quality 13-megapixel rear camera, and an 8-megapixel front facing camera makes it one of its kind. Try this phone and you won’t regret purchasing it! If you’re not a fanatical Android lover, then iPhone 7 Plus, the greatest handset by Apple is definitely an alternative to Samsung Note 7. With 5.5” bright screen and the fastest innards of any smartphone, iPhone 7 Plus looks superb. The camera of iPhone 7 Plus has sharp and clear shots across all lighting conditions, and you can zoom up to 2X without losing any picture quality. If you’re not a person who’d like to customise his phone with multiple apps like any android offers then the phone supporting iOS 10 is worth considering. One Plus 3 is the best buck-value smartphone that comes with Stuff HQ. It’s hard to find any other phone in a price range of $350 with amazing features. The phone has a metal body, a decent camera, and the specifications of a modern smartphone. The phone comes with an AMOLED panel means you’ll be treated to dynamic colors similar to those you find in any Samsung’s phone with the best display. I think the 5.5” screen smartphone at such unbeatable price is definitely an alternative and worth considering. Now that you know what you get from each alternative for Samsung Galaxy Note 7, you should be able to make a choice. If you’re still confused for some reason, take a look at the pointers below. What do you love the most about Samsung Note 7? Look for a phone that matches Note 7 for that feature. Are you conscious about the weight and the dimensions of the phone you carry? If that’s you, then take a closer look at the technical specifications of each of these alternatives, including phone weight and screen size. Why you want an alternative to Note 7? What’s your biggest reason to read this article? Note it down. It will help you make a decision. In case you are still not sure, just try out one of the phones from the above list. These are the best phones out there right now and getting any one of these would be awesome. Good luck with your new phone. We’re sure it won’t explode like the Note 7 did!